I hope everybody enjoyed their holiday. But, before we dive back into the meatier topics of the news, I wanted to share this serpentine graphic from the Guardian I discovered last week. 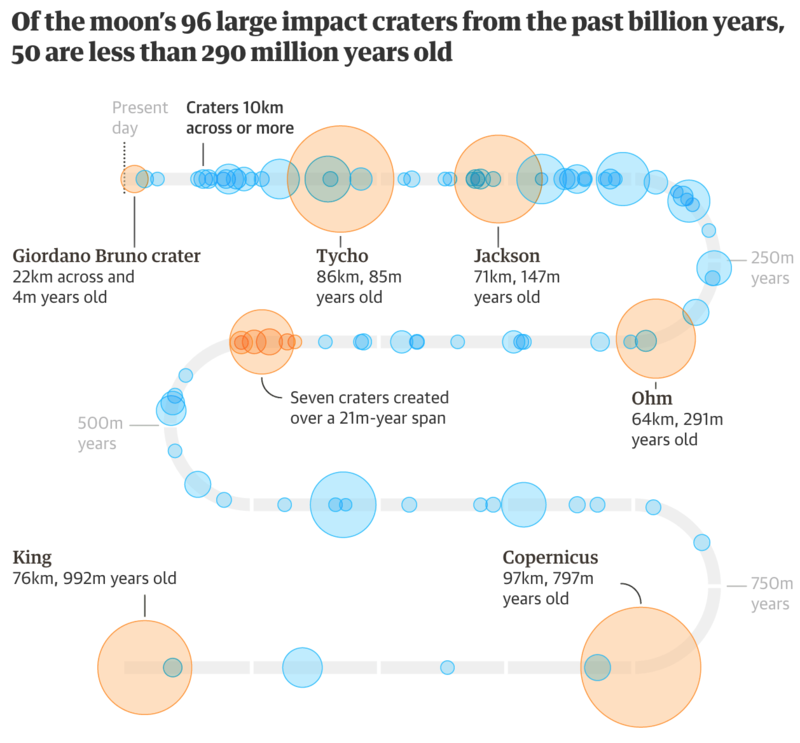 Functionally it is a timeline charting the size of 96 known large asteroid impact craters on the Moon, between 80ºS and 80ºN. The biggest question I have is whether the wrapping layout is necessary. I would prefer a more simplistic and straightforward, well, straight timeline, but I can imagine space constraints forcing the graphic into this box—either for the digital version and/or the likely print version. The transparencies help to give a sense of density to the strikes, especially in the later years. And the orange ones highlight important or well-known craters like Tycho. I do wonder, however, if the designer could have added a line at the 290 million years point. Since the graphic’s title calls that year out in particular, it might help the audience more quickly grasp the graphic’s…impact. 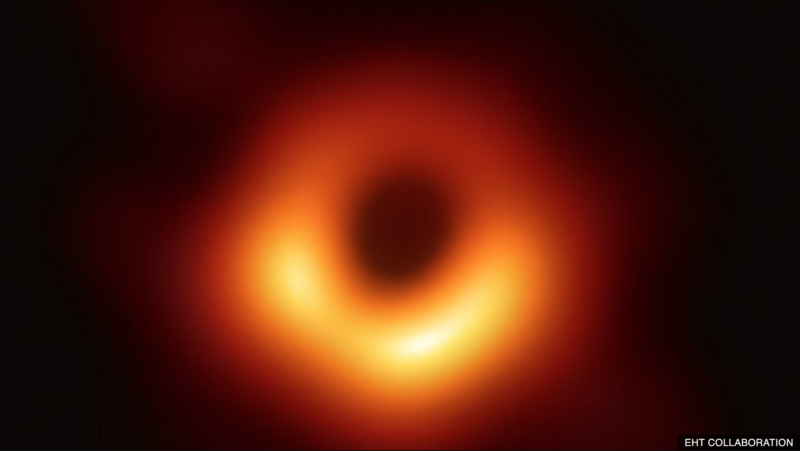 In theory, the reader can more or less figure it out from the highlighting of the Ohm impact crater that is listed as 291 million years old. 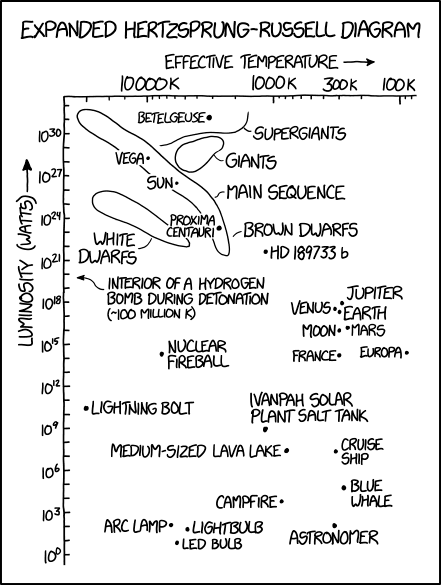 But a small grey line like those for the 250 million year increments could have been a nice little touch. Overall, however, it’s nice to see a compact and helpful space graphic. 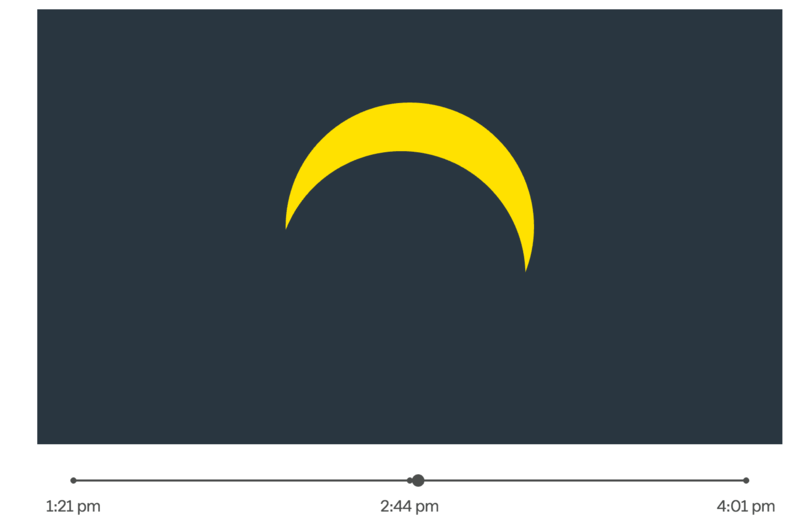 Credit for the piece goes to the Guardian graphics team. Yesterday, space nerds were alerted to the news that 12 new moons have been discovered in orbit of Jupiter. These are much smaller than Jupiter’s moon Ganymede, which is the largest moon in the Solar System and is larger than even Mercury. The point is that there are almost certainly no Ganymede-esque moons orbiting Jupiter that remain undiscovered. But despite their small size, these moons do have some interesting features, as the article I read in the Guardian pointed out. The most interesting is the orbit of the moons. 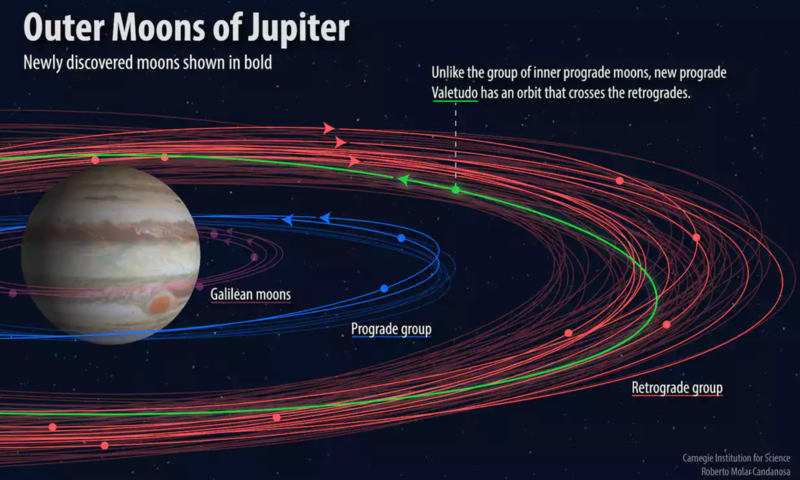 In general, Jovian moons orbit either prograde, i.e. with the orbit of Jupiter, or retrograde, i.e. against the orbit of Jupiter. The two inner moons discovered are prograde and nine of the other 12 are in an outer orbit of retrograde moons. But Valetudo, the 12th, which orbits in the retrograde group, actually orbits in a prograde fashion. 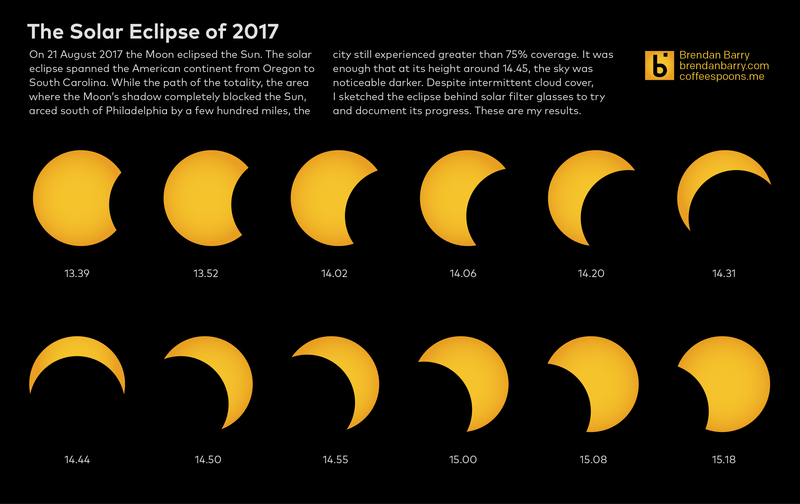 The graphic below from the Carnegie Science Institute does a pretty good job of showing this. Ultimately this means that at some point in the future, Valetudo will slam head-on collision style with another Jovian moon. And reportedly that will be so intense we will be able to see it from Earth. Bangin’. Catch is that it will not likely happen anytime soon. As for the graphic above, I am of two minds. I generally like the use of colour. The bright green contrasts starkly against the red—though it should be pointed out it would fail a red-green colour blindness test. And then the interesting, but admittedly less interesting prograde and previously discovered Galilean moons are in more muted blues and purples, which puts them further into the background. It works nicely as a complete package. But should it be on a deep blue background? 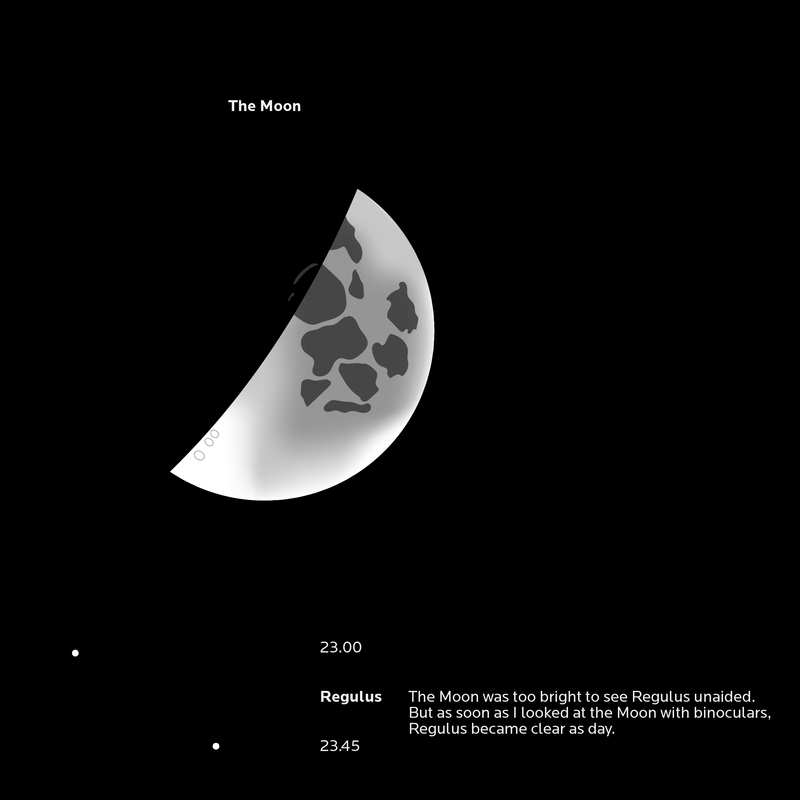 Lots of space visualisations use black backgrounds, including my work and the work of others. But sometimes work that uses a white or otherwise light background could more clearly show things like orbits. It is difficult to say with certainty because of the lack of a light background for comparison’s sake. 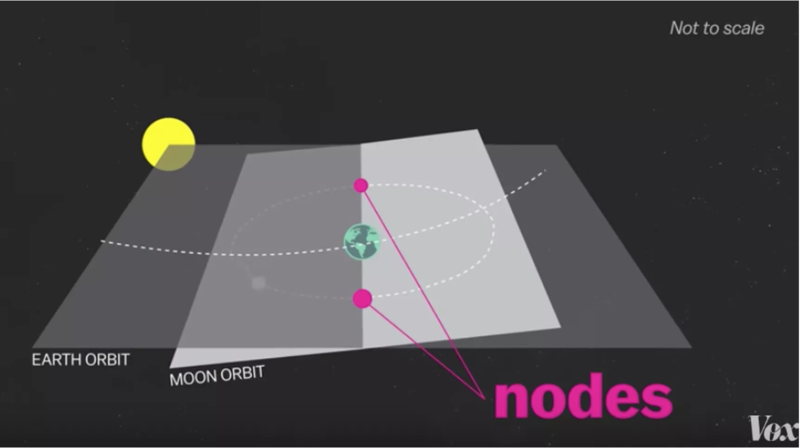 The other thing that gets to me is the viewing angle of the orbits. Clearly we are looking neither dead-on nor from high above. And that makes it a bit more difficult to compare orbits. Of course these might not all be on the same plane because orbits are in three-dimensional space. But if the orbits were all shown from above, it would certainly aid with problems of foreshortening. All in all, though, I shan’t complain because we have more moons in the Solar System. And who knows how many more smaller moons both Jupiter and Saturn have. Credit for the piece goes to Roberto Molar Candanosa. Today is Friday. We all made it through yet another week. So let us look up into the evening sky tonight and see the Hertzsprung–Russel diagram in action. Or, we can take xkcd’s expanded version and just enjoy ourselves. Here in Philadelphia, the weekend is forecast to be not rainy, which is a departure from the last several weeks. 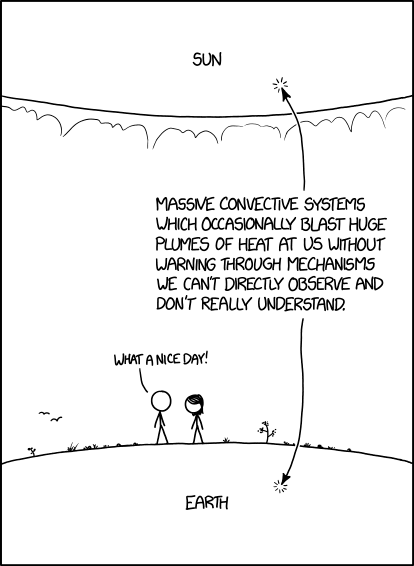 So this piece from xkcd’s Randall Munroe seemed appropriate. Monday night I was doing some work outside and when I turned around to head inside I was struck by the brilliance of an object in the night sky. I had seen the Moon rise earlier in the evening, but this was far to the east. It was identifiable as a dot, not just a speck in the night sky. As I was now intrigued I went to grab my binoculars to see if I could see Venus. Turns out I was wrong and it was Jupiter. But then I turned my binocular-aided eyes to the west and examined the Moon. That was then I decided to try and sketch my observations, as I had done with the Eclipse. The Moon and Regulus. The cool part is the thin ring of one of the seas that could be spotted beyond the line separating lunar day from night. Capturing the exact shapes of the lunar “seas” was difficult in the darkness. Jupiter and two of its moons. 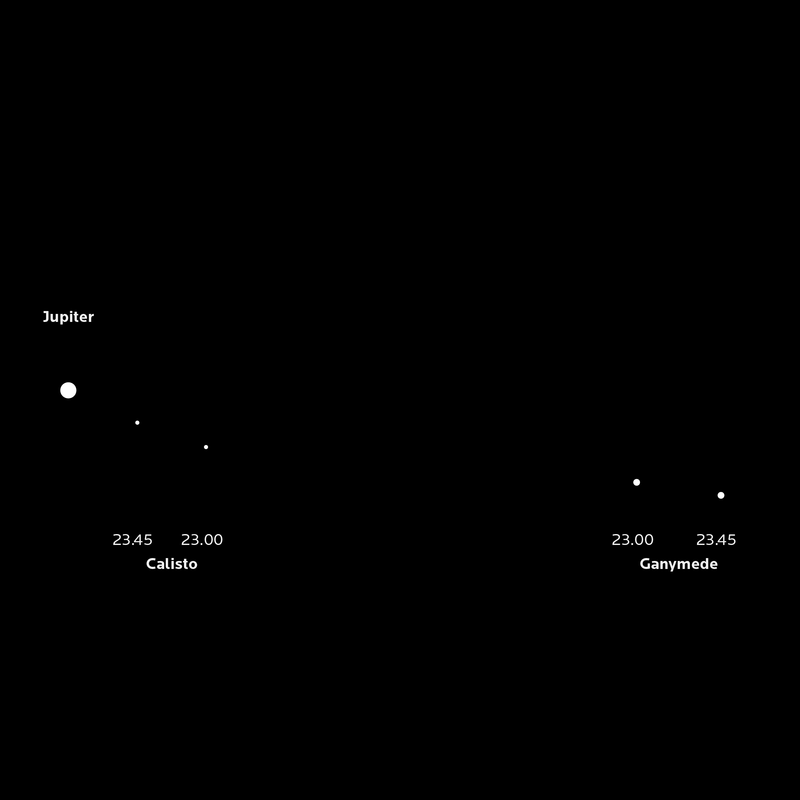 The cool thing about Jupiter is just being able to see it as a round ball in space and not a distant twinkling speck. Credit for these is mine. There are a bunch of things to look at this week, but what am I most excited about? Voyager. No, not Star Trek. (Did you know that the Vger entity from the first Star Trek film was a replica of the Voyager probes?) I am of course talking about the Voyager mission to the outer Solar System and beyond. 40 years ago today Voyager 1 lifted off from Cape Canaveral—Voyager 2 left two weeks earlier, but would reach Jupiter and Saturn after Voyager 1, hence being named 2—and it has been collecting images and data for science ever since. 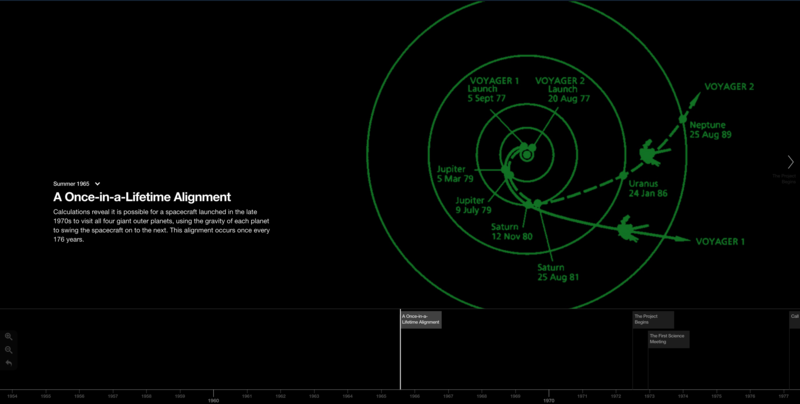 On 25 August 2012, Voyager 1 emerged from the heliosheath and entered interstellar space. In other words, Voyager 1—and sometime in the next few years perhaps—is the first manmade spacecraft to ever leave the Solar System. Mankind is finally out there among the stars. So JPL and NASA put together this interactive timeline of the mission, which of course continues tomorrow and for years after today until their nuclear fuel runs out. Credit for the piece goes to JPL and NASA.